BUCYRUS — To say Keith Fernandez had a productive weekend is a massive understatement. Fernandez, a Colonel Crawford High School senior, has been collecting non-perishable goods for more than a month as part of an Eagle Scout project. On Saturday, kind of on a whim, in the Walmart parking lot in Bucyrus, he started collecting products to send to Houston to residents affected by Hurricane Harvey. In all, he collected more than 3,300 pounds of food, water and other items that are likely already headed to Houston via the Grindstone Tap House in Berlin Heights. On Sunday, Fernandez and his family sorted the items received on Saturday, and on Monday, they made arrangements to get the goods to those in need in Houston. The amount of positive public contact Fernandez has had in recent weeks is overwhelming. He said his drive to collect for food pantries in Galion, Bucyrus and Crestline — and his latest project to help Harvey victims — had changed him. A man he never met before offered the use of a trailer to take his haul to Berlin Heights. He actually came in contact with the group at the Grindstone Tap House through a person he met at St. Paul’s Lutheran Church in North Robinson, when he was collecting items for his Eagle Scout project, which has a goal of collecting 100 bags or non-perishable items for pantries on Galion, Crestline and Bucyrus. That project is continuing for another couple of weeks. There are food collection boxes at these sites: Galion, Bucyrus, and Crestline libraries; YMCAs in Galion and Bucyrus; Peace Lutheran Church in Galion; First Lutheran Church in Galion; Good Hope Church in Bucyrus; the Bucyrus Farmer’s Market every Saturday from 8 a.m. to noon; and the Crestline Farmer’s Market each Tuesday from 3-6 p.m. So if you’re in Galion, Crestline and can pick up a few extra non-perishable items on your next visit to the store, remember Kenneth and his effort. In the meantime, despite the fact Ken’s successful food drives have created lots of work for the family, Ken’s mother, Mary Fernandez could not be happier. Courtesy photo Colonel Crawford senior Ken Fernandez stands in front of a Jeep at Walmart in Bucyrus filled with food, water and other items for victims of Hurricane Harvey in the Houston area. Fernandez and the Bucyrus community — in about eight hours filled the jeep and trailer and more. 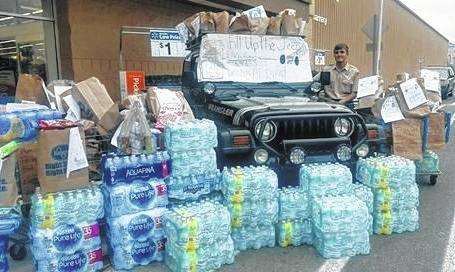 https://www.galioninquirer.com/wp-content/uploads/sites/38/2017/09/web1_Jeep-bound-for-Houston.jpgCourtesy photo Colonel Crawford senior Ken Fernandez stands in front of a Jeep at Walmart in Bucyrus filled with food, water and other items for victims of Hurricane Harvey in the Houston area. Fernandez and the Bucyrus community — in about eight hours filled the jeep and trailer and more.